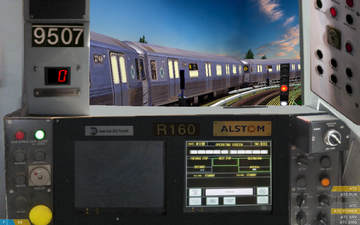 NYCTA class R-142 electric subway train. The train consists of 10 motorized cars. One R-142 unit consists of 5 permanently coupled cars. This train consists of two 2 such units coupled. Photorealistic driver's stand with digital speedometer and pilot lamp. Exterior view available for OpenBVE. 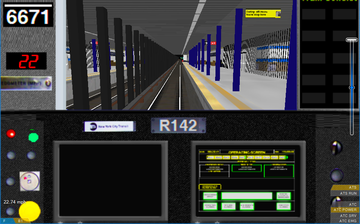 This new version of the R-142 subway train uses other directory names than old versions of R-142 that is wanted by some of the elderly routes. The old directory name used by was "r142". The new version uses the directory name R142_OpenBVE 2012a (line 4), R142_OpenBVE 2012b (line 2) and R142_OpenBVE 2012c (line 5). NYCTA R-32 Brightliner electric subway train. One R-32-unit consists of 2 permanently coupled motorized cars. The train comes in 5 versions with 2, 4, 6, 8, or 10 cars. Data below is for a R-32 train that consists of 8 cars. 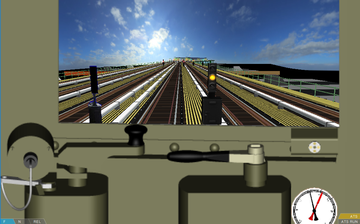 Photorealistic driver's stand with digital speedometer, manometer (pressure gauge), and pilot lamp. The brake and power handles moves with the simulation in OpenBVE. These new versions of the R-32 subway train use other directory names than old versions of R-32 that is wanted by some of the elderly routes. The old directory name used by was r32 . 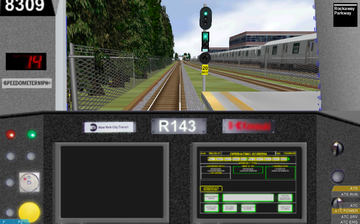 The new version uses the directory names R32 GOH 2 Cars , R32 GOH 4 Cars , R32 GOH 6 Cars , R32 GOH 8 Cars and R32 GOH 10 Cars . NYCTA R-36 Redbird electric subway train. One R-36 unit consists of 2 permanently coupled motorized cars. This train consists of 5 such units coupled. 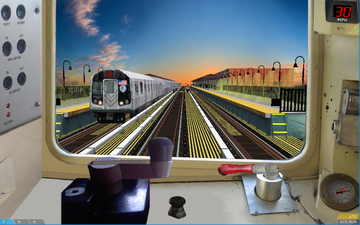 The R-36 class was after about 30 years of service one of the most reliable class of cars in the New York subway during the 1990 decade. Driver's stand with speedometer, manometer (pressure gauge), clock and pilot lamp. This train has disappeared from the website BVEstation. NYCTA R-46 electric subway train. The train comes in two versions: One consists of 8 motorized cars, the other of 4 motorized cars. Data below is for the 8 cars consist. One R-46 unit consists of 4 permanently coupled cars. The 8 car train consists of 2 such units coupled. 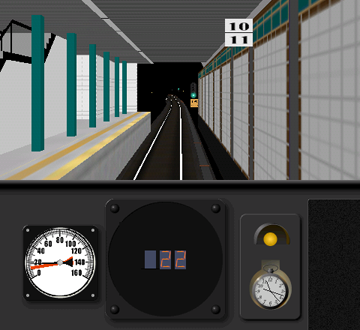 Photorealistic driver's stand with digital speedometer manometer (pressure gauge) and various control lamps. The master controller is moving and follows the simulation in OpenBVE. 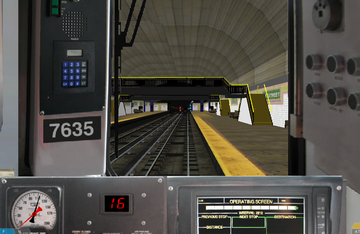 This new version of the R-46 subway train uses other directory names than an old version of R-46 that is wanted by some of the elderly routes. The old directory name was r46_2 . NYCTA R-68A electric subway train. The train consists of 8 motorized cars. 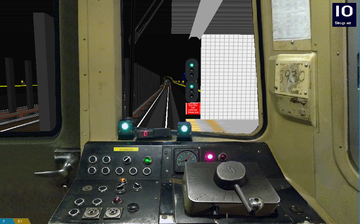 One R-68A unit consists of 4 permanently coupled cars. This train consists of 2 such units coupled. Driver's stand with digital speedometer (see text at Misc. below), manometer (pressure gauge) and pilot lamp. The power handle and the break handle are both moving and follow the simulation in OpenBVE. 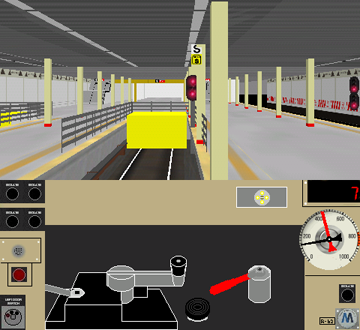 This train simulation is from the year of 2002. 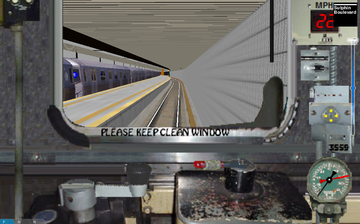 The digital speedometer indicates speed in km/h, but the speed indicators in the New York subway indicate permissible speed in mph.